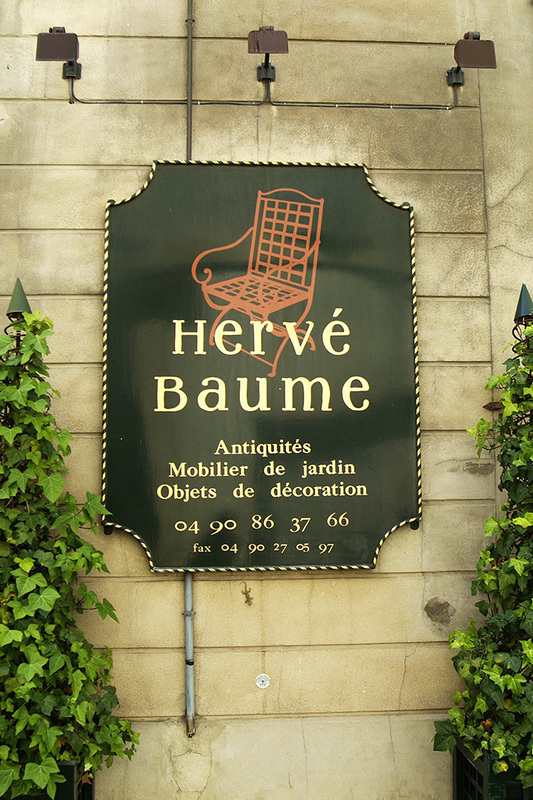 I suppose that it should come as no surprise that one of France's most reputed antiquaires and designers of garden furniture, Hervé Baume, should have a spectacular courtyard behind his boutique in Avignon......and yet as many times as I have wistfully peered in his showroom windows I had never discovered its existence. And found a secret corner of Provençal heaven. Every element was just perfect. 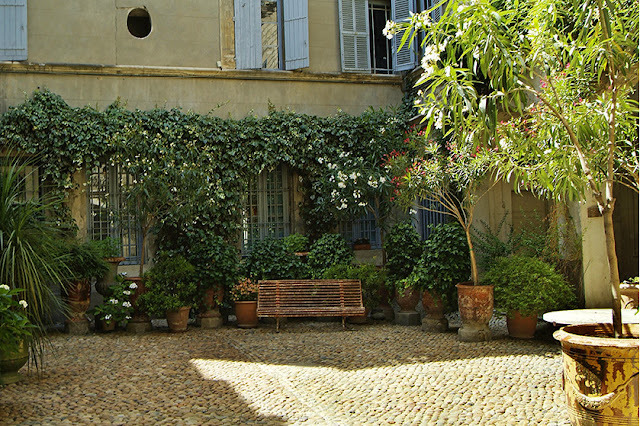 From the calade or cobble-stones to the gorgeous plantings in waist-high Anduze planters (more than I have ever seen at one time) and sky blue shutters rising above. ...and even an artists atelier worthy of Picasso en face. ...one where I could have made myself comfortable for a very long time indeed. But the rest of the afternoon was calling. 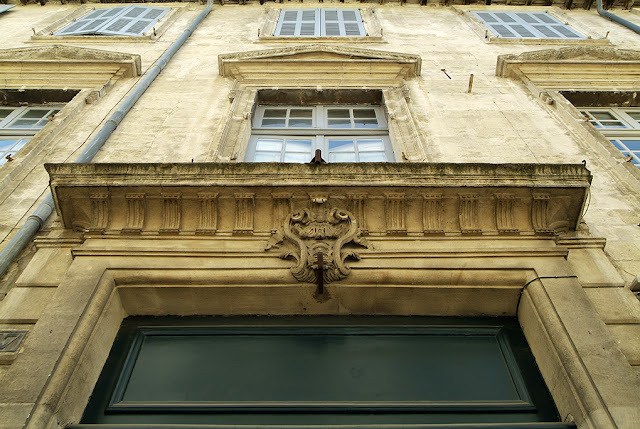 As I ducked back out into the bright sun, I noted the plaque by the main entrance, naming this incredibly fine building the Hôtel Tonduty de Malijac. 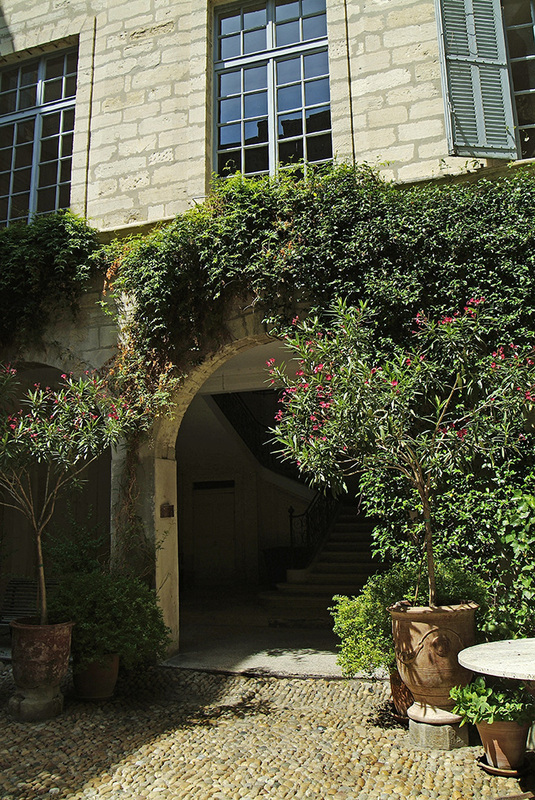 It turns out that this 16th century private mansion passed in the 17th century to Baron François Tonduty de Malijac, who was a Seigneur of Saint-Légier, a legal advisor, a dignitary for the University of Avignon and an astronomer formed by a Jesuit! In 1983, the building - for its facade, roof and yes, courtyard with its stairway - was declared a Monument Historique. .Now, let's see...and I apologize that these photos are not up to snuff. 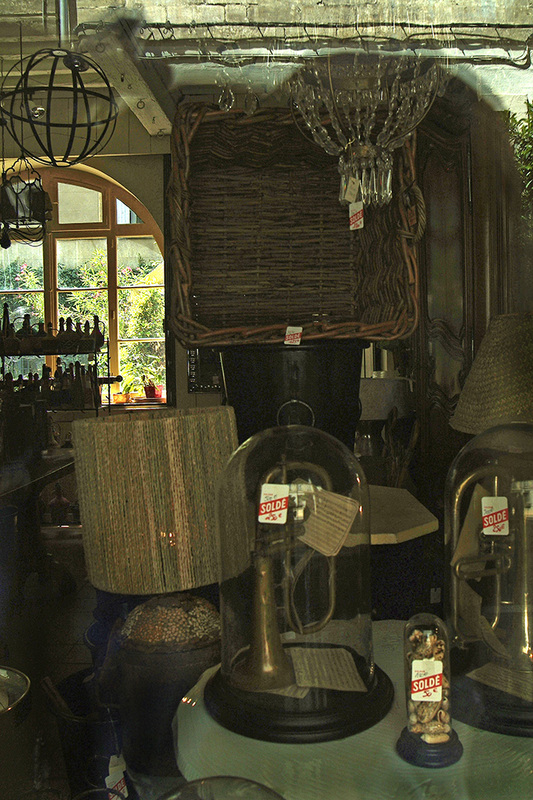 As I mentioned, the brightness of the outdoor light made for quite a contrast to the darkened interior...Ah yes, it was L who pointed out the giant and quite rare woven basket at 125 Euros. I appreciated the sea-shelled filled dome at a mere 30. 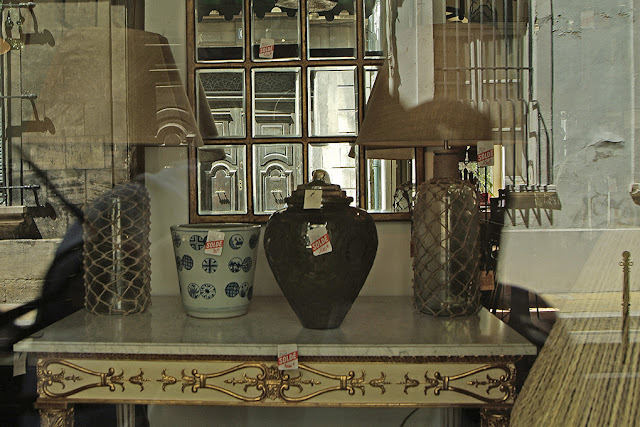 Certainly, the gilt touched console was still not a bargain at 4000 but I could easily see the lamps in a beach house at 125 each, thought of a friend who would have swooned over the blue and white garden pot at 30 and was fascinated by the intricately etched smoke glass jar for 130. Below were tall crystal photophores for 120 and an ex-voto that I most certainly wouldn't have been able to resist at 25. I honestly don't know if the courtyard is open all of the time or if we just were lucky! 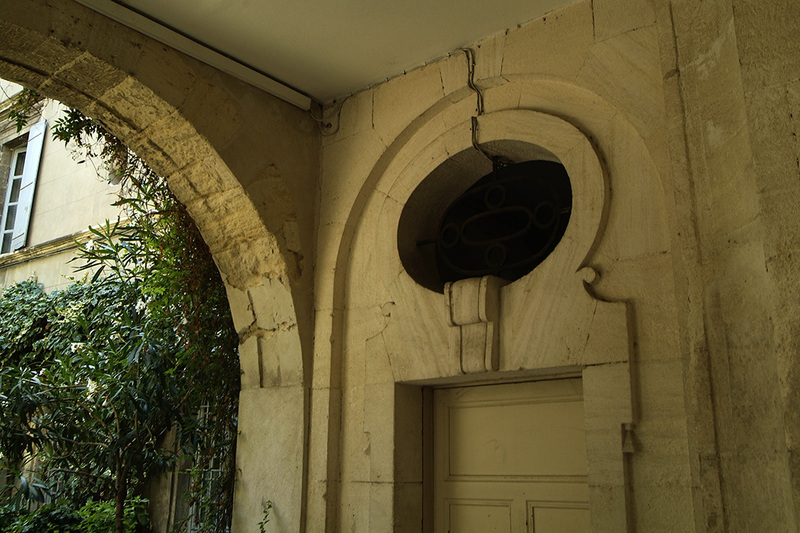 But it truly is one of the prettiest that I have seen in Provence. 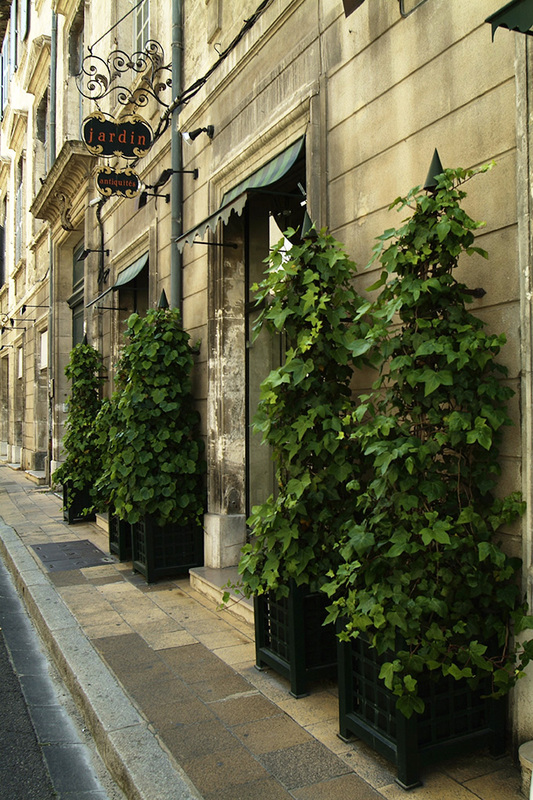 You will find the entry to the left of the boutique. Perhaps you will let me know if you happen to pass by? Looks absolutely wonderful! 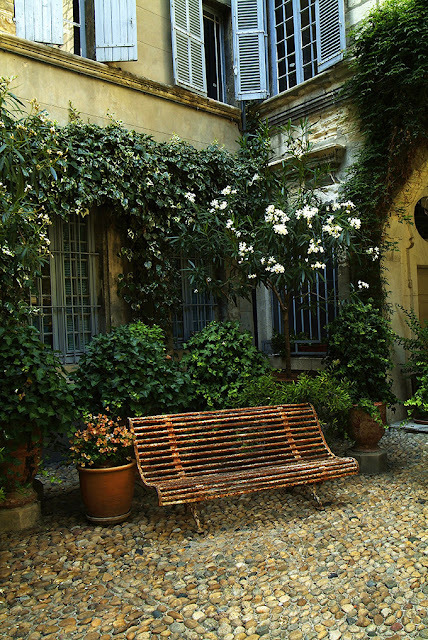 The perfect courtyard. Wish I were there with you. You certainly were in spirit! 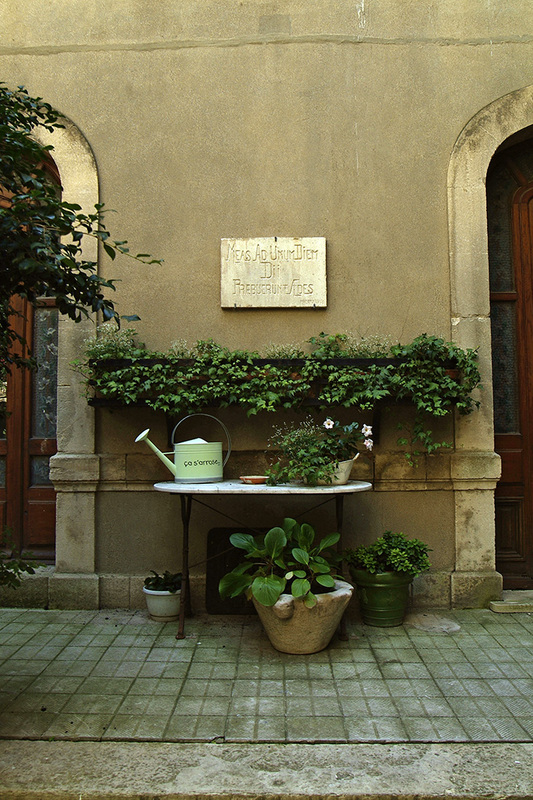 Amazed that we haven't stumbled across this shop and garden given that one of our favorite Michelin Bib Gourmand restaurants in Avignon is just down the street called l'Essentiel. If you have not been there, you should check it out. 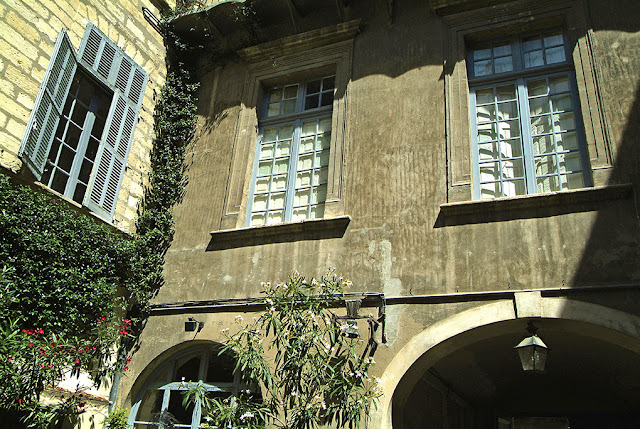 They have a lovely interior courtyard for dining al fresco. Recommend it highly. What a delightful place. It looks like a place of total peace and tranquillity. The antiques are not too shabby either. 2nd swooner for blue on white pot checking in ! 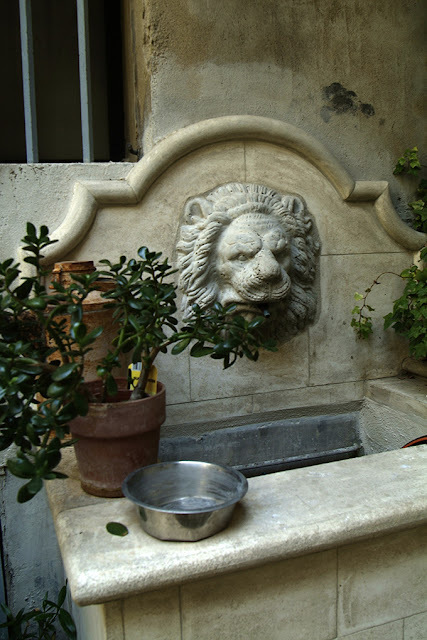 So many wonderful sights in that courtyard. 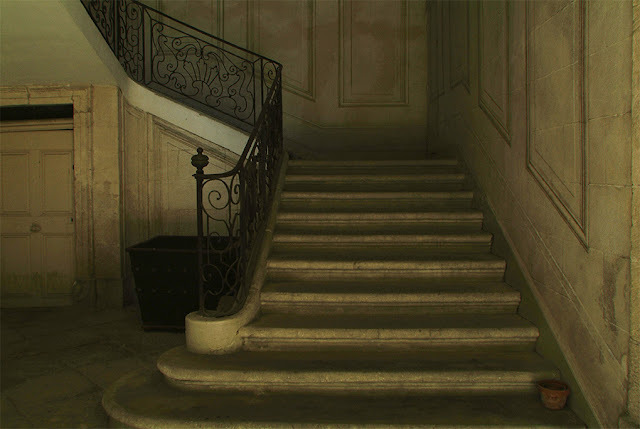 Loved the staircase and the oeil de boeuf - both reminded me of Le Petit Trianon. Elegance and grace. Exactly! And yet simple in the forms, I just love it...and Le Petit Trianon too! You were very brave Heather, to stealthily enter the courtyard! What a find! The cobblestone courtyard and all the potted plants. What an oasis of calm! 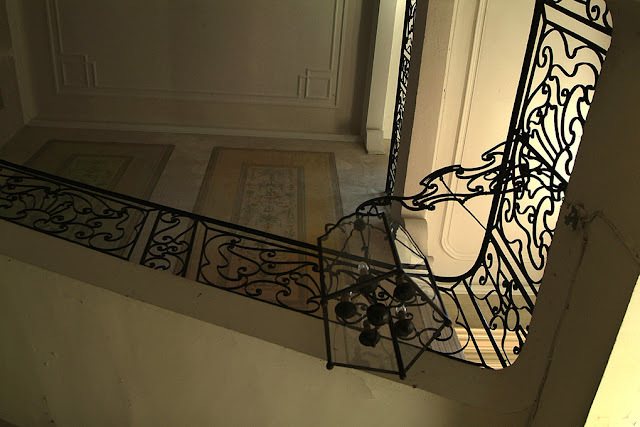 But the wrought iron railings on the stairway and the beautiful hanging light, just gorgeous! Can't you just imagine what it must have been like in the past? With carriages pulling up to let out their illustrious passengers who would then sweep up that fantastic staircase? Thank you Gretel but I am just a scaredy cat following my brave friend! Picture perfect - just lovely! Merci, Stacey. So nice to have you here! I am also timid about entering places that "might be" private. Fortunately, Steve is not! 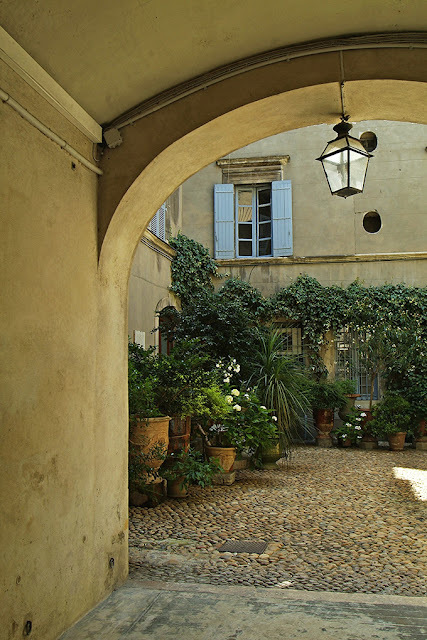 This courtyard would have given me palpitations, for sure!! So glad you were brave and went in. Such a treasure! Eyes to look and inquire, balancing the comfortable and startling, and a pen to tell the story. 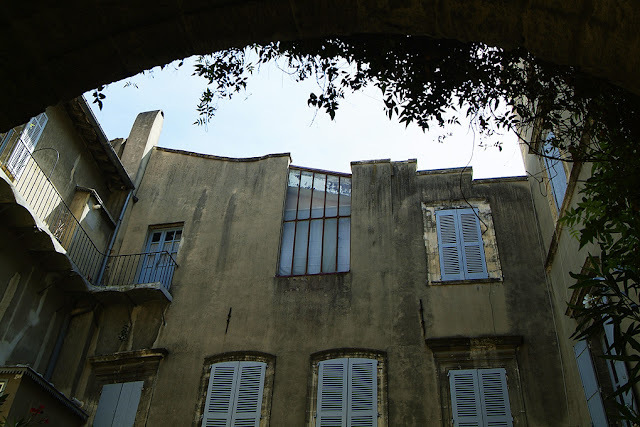 You added one more: photos that lead to more personal exploration. 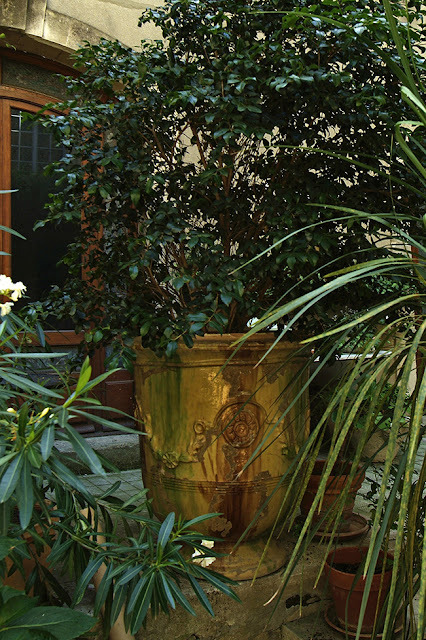 "a living, joy-filled garden.” and an antique store can fill a heart for a long time. Heather, it truly is a magical place!!!! You know the garden is the star of the show. I do hope they love their garden as much as you do. Gives a new meaning to the phrase 'picture perfect'!